Awhile back I gave a presentation about integrating press into SEO campaigns, specifically how to use HARO and how it could be used efficiently by small businesses. Since then I’ve heard a lot of stories from people (including a lot of agencies, to my surprise) who have had significant difficulties getting picked up through HARO. Between our clients and our own brand, we have used HARO for earning links in our digital PR campaigns for our enterprise link building accounts, as well as our link building packages. Over the years, success has been found with placements in Coca-Cola, Northwood University, Entrepreneur.com, Nasdaq, and several others using HARO. Hopefully this post will help remedy some of the obstacles, and illustrate how to use HARO more efficiently. 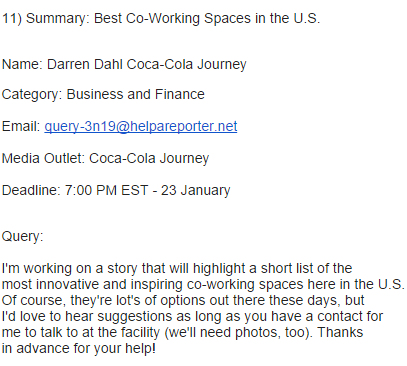 First off, HARO (Help A Reporter Out) is a service that sends out a free newsletter 3x per day covering the latest requests from journalists and reporters looking for sources as they write articles/ebooks/books, etc. Queries are sent in from journalists, business owners, marketers, entrepreneurs, and the like. The idea behind HARO is that “everyone’s an expert at something”, so the newsletters act as a matchmaker of sorts to try and match up these experts with journalists who need sources. What makes getting exposure through HARO difficult is the fact that there are so many experts (or at least people that think they’re experts) that respond to these requests. With so many people responding to any given request, it can be tough to make an impression. Obviously you’ve got to sign up for the service to get started. While you’re setting up your account, you’ll be prompted to specify which categories of emails you want to receive. For instance, there’s Master HARO (which includes every category), Business and Finance, High Tech, Biotech and Healthcare, Energy and Green Tech, Lifestyle and Fitness, Sports, Entertainment and Media, Public Policy and Government, Education, General, Giftbag, Travel, and UK. Depending on what your process and business is, you’ll probably want to customize this part. Sticking to this “standard” will increase your chances of getting your pitches noticed and, ultimately, getting picked up. You might think that responding to as many requests as you can would increase your chances of inclusion. I’ve actually found the opposite to be true. Using HARO as a link building tool and traffic earner doesn’t do any good if you constantly reply to requests that aren’t good fits for your business. This is precisely why your first step should be to qualify every request. Just like qualifying anything else in the online marketing arena, making sure a HARO opportunity is a good fit is all about context clues. Name. I’ll usually Google the person making the request to see how much experience they have, find out if they contribute regularly to the media outlet in question, and get a feel for their social presence. Again, this is about context. The answers to all these questions will help you figure out what level of information they’re looking for and what kind of content they’ll expect (and favor). Media Outlet. Sometimes this will read “Anonymous”. That’s usually a no-go for me. Anonymous could either imply that they can’t disclose who it is that they’re writing for or it could mean that they don’t want to disclose who they’re writing for. Either way it can be a risky and rather time-consuming process to reach out to these requests. Unless it’s seriously relevant, I’ll usually pass over these. On the other hand, you might see Inc.com, Wall Street Journal, or USA Today in this field. In that case, you definitely want to make sure and read through the request. Earning your way onto sites like this with a good pitch can bring large amounts of referral traffic, help build great relationships, and of course, get you a valuable editorial link. Deadline. This is one of those things that can make or break a HARO request when qualifying. If the request doesn’t give you enough time to respond with a well thought out message, or if you simply don’t have the time to reply immediately, you may just have to pass it up. Be aware, though, that short deadlines could increase your chances of getting your pitch included if you’re able to get back to them quickly with a well thought out response when others aren’t. I’ve seen deadlines as short a two hours, so make sure that you pay attention to when the information is needed; otherwise you may miss the window. Relevancy. This should be a no-brainer: Make sure the request is relevant to your business. Replying with a pitch that isn’t relevant is just going to make the recipients frustrated, and in an industry that relies heavily on relationships, you definitely don’t want to become a thorn in anyone’s side. Now that you know the request is probably a good fit, you want to make sure you respond quickly. A typical pitch count can be anywhere from 25 to more than 100 depending on how popular the outlet is. That means that the journalist is going to be inundated with pitches for hours and even days after the email gets sent out. Do you think it’s better to be the 2nd pitch that gets read or the 82nd? Exactly. Obviously you’re not always going to be able to answer a query immediately. I’m in Dallas, and we’re on Central Standard Time. This means that I get the morning wave of HAROs around 4:45 a.m. I’m an early riser, but damn, that’s pushing it. Rarely am I able to respond within the first 30 minutes after the morning wave. The second wave comes through at lunchtime, and the third around 5 p.m. (I guess you have something to read when you’re stuck in bumper to bumper traffic?). Suffice it to say, there are going to be plenty of pitches that are just going to have to wait. Even if I can’t respond to the request right away, though, I’ll star it in my inbox and save it for later. Given that you are probably not a full-time HARO stalker like me, you will want to make sure to have some type of reminder system in place to help you respond as quickly as possible to any promising queries that come through when you’re not available to respond. Personally, I star all my emails that require action so that they appear at the top of my inbox. This way I’ll remember them the very next time I look at my inbox. It’s important to remember here the number of responses you’re going to be competing with. In addition to being fast, you also want to do your damnedest to be unique. It’s just like us when we come across content—it’s got to be something with character, pizzazz, sheer awesomeness, and without fluff, for us to stick around and read the whole thing right? Your HARO pitch needs to be the same. Along with your topical response, try and mention other qualifications that relate to the request. Perhaps you were interviewed or quoted on this subject before. If so, don’t hesitate to give them the where and when. Maybe you’re a blogger who has “in the trenches” experience with the request in question. Again, don’t be shy about letting them know.For example, you could be a business blogger that is obsessed with passive income ideas and you see a request that asks for a background in starting online businesses, this would be the perfect fit. Again, don’t be shy about letting them know. Just like you have to qualify the requests, the journalists have to qualify you. Make sure you give them a reason to be interested. This can be likened to trust signals on your landing pages. You have only a brief time to make a trustworthy and convincing impression with the traffic that clicks through, so you want to do everything in your power to convert (don’t try to use attachments to achieve this—they won’t go through the HARO email system). Responses generally aren’t going to be lengthy; the requests themselves will often say as much. My general rule of thumb (if there’s not a word count) is to say as much as I need to pitch them – no more. Keeping the pitch brief and full of substance increases the chances of your pitch being read, and can even serve as a foundation for a followup if it’s needed (think: leave them wanting more, just as you would in your newsletters). Will there be responses that end up being longer? Of course. But keep it meaty, and realize that your pitch isn’t the only one they will be reading. First off, let me give you some context and tell you the logistics of how we undertake this process with our clients. We train clients on these four points and why they matter, as well as show them examples of previous successful requests. Instead of using personas to respond on behalf of our client, we forward any relevant requests to the clients themselves right away. This ensures that the quality of information is as high as it can be. Obviously we face some obstacles in getting clients to take the time to respond, but hey, that’s life. The Common Desk is a coworking space in the Deep Ellum neighborhood of Dallas. We worked with the owner to make sure that he kept these four points in mind when responding to a request we sent him, and we were off to the races. Fortunately, he already had a good feel for how to market himself, so this made our job a whole lot easier. Remembering the qualifying step, we can see that this request is certainly from an actual person/journalist at a popular outlet, that we had enough time to respond, and that the subject matter was very relevant. After qualifying the request, I reply with speed, uniqueness, and brevity. For unique, I made sure to include relevant affiliations and places where The Common Desk had already been covered. This is unique in the sense that many of the other respondents were unlikely to have similar mentions. Darren was receptive to our response, and a few days later the post went live. We were in good company and certainly pleased with the outcome. The piece continues to drive traffic to this day and, of course, is a valuable link. 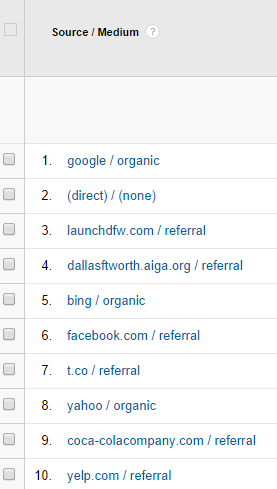 Referral traffic from Coca-Cola still going strong after several months of publication. The second example is from MightySkins.com, a company offering vinyl coverings for various types of devices. Since the request was looking for hard data, we went ahead and responded to this one personally as well. The request called for ecommerce users who had used analytics to make improvements to and increase the revenue of their site. 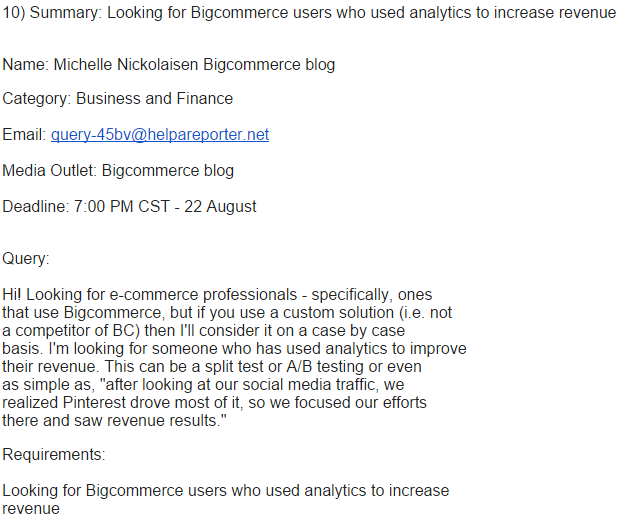 HARO request for sources re: ecommerce professionals. This particular request was easily qualified. It’s very relevant, includes an authentic author, gave plenty of time to respond, and was for a credible outlet. Again – qualify, speed, unique, and brief. As you can see, this response is not quite as brief as the previous pitch. However, in this case it can be easily justified since the reply was informative and addressed what she was looking for specifically. As for being fast, I was able to reply within 5 hours. The request was in the morning HARO, so I received it at 4:30 a.m. and replied by 9:30 a.m. Not quite as fast as the previous example, but she probably wasn’t up that early either. In my experience, one of the best ways to be unique is to be revealing and transparent. Presumably, everyone responding to this particular request is going to to have good results, so I knew that might not be enough for this pitch. That said, I took the transparent approach and was up front about some of our weak spots as well, a point I was confident would set this pitch apart. A couple weeks after sending over the pitch and coordinating on the details, we were delighted to see the completed post. Our experience was included in a business analytics series so it fit in nicely. 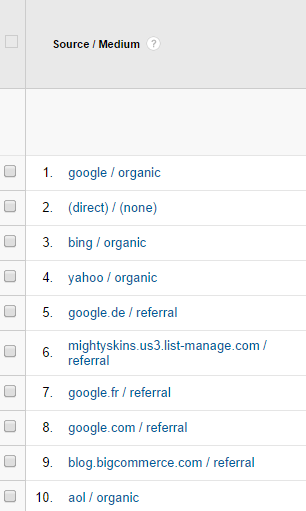 Solid amount of traffic from placement in BigCommerce write up. Similar to how we think about content assets, having the press in notable outlets can serve as a crucial trust signal and can help increase your presence, boost sales, or even help brainstorm blog content ideas for later. So it’s important that you don’t think you’re finished just because you were successful in getting a mention. After I gave the aforementioned presentation, I was asked, “I’ve gotten a lot of press, but what can I do with it?” “Press pages” was my immediate response. I think press pages are a hugely underrated sales tactic for many online businesses. Hell, even our site could do this more effectively. Keep in mind, journalists will often look for a page like this when determining your credibility. Don’t be afraid to get creative—just look at Mapbox. If you have a good enough story that gets mentioned somewhere, it’s entirely possible to leverage it to get picked up somewhere else. This is very advantageous for us marketers because it means we can create a snowball effect if we do a good job at getting the word out. The Common Desk example is a perfect representation of this. After we secured the successful mention, The Dallas Morning News thought the article was interesting and published this article on the same day. This is key. Building a relationship with people who have initially published what you have to say makes them good candidates for assets down the road. If it’s in their field, they’ll be a lot more likely to help promote your piece on their blog or via social media. No doubt, you have a black book of guest blogging ideas or websites; do something similar with your HARO contacts. Jared leads the Heroic Search link building campaigns, and oversees account management for the company. In his downtime, he enjoys playing tennis and a good cup of coffee. Jared, this is--by far--the best how-to for using HARO. Too many subscribers use it as a quick and dirty shortcut, thinking it frees them from doing a lot of work to get results. You've proven just the opposite. You can get fabulous publicity and valuable links if you take the time to read the queries carefully, research the journalists, write compelling pitches that are on-target, and give the journalists time to respond. This post is the lead item in my email tips today. Hi Joan, thanks for the kind words! I agree, it takes a good amount of work to stay on top of queries and continuously get placements. I'd love to see the email, is it the newsletter through your website? Thanks for this Jared! I'm still trying to get success on HARO. I'm still a bit stuck on whether I should be supplying a quotable reply upfront, or just a pitch and wait for a reply. In your examples, it looks like you did one of each? I often see requests like, "I'm writing an article for 'Big Site' about 'topic'. If you have advice or anecdotes, please let me know." Should I just give a quick intro and then 2-3 sentences to give them what they're looking for? Or just point out why I'm the expert they're looking for and tell them I'm available for questions? It really depends on the situation Tom. I always try to put myself in the shoes of the person writing the query. Understanding their intention often tells me if I should reply with just a "Hey, I'm available" attitude, or if a more in-depth, full-on answer is needed. In my experience it's usually the latter. Having also been on the other side of the queries, this is because they want to look a the responses quickly so they can decide easily which responses they want to use. This is especially true with larger publications that attract a huge amount of responses. Regardless of which route I take, I always let them know that they can reach out to me if they need more information or want a follow up. Jared - a comprehensive look at the ins and outs of using HARO which can be transferred to other ways of making yourself known for your expertise. Thanks. Thanks a bunch Virginia, I'm glad you enjoyed the post. And I totally agree, using HARO can be such a huge help to your business and overall presence in many ways. Jared. Love the advice. Do you do any quick research on the requester? I have found success when I can tailor a response to invoke some recent articles on the topic or something that may be relevant. Maybe only adds 10 minutes of time to find something relevant. And although I cannot say for sure the extra effort results in increased rate of placement, it seems to have an impact. Thoughts? Also, I agree a press page makes lots of sense! Thanks a lot Steven, I appreciate that. Yes! I definitely do some investigating on the researcher, but mostly I look up the entity that it will be published on. If I can get an idea of where it will be placed, that gives me a lot (sometimes more) clues on 1) whether my response will be accepted, and 2) the personality of the audience that my response would be catering to. And if you respond to enough responses, over time this also has the added benefit of giving you clues of which outlets don't publish a lot of responses (I've even thought about keeping a running tally of outlets to get some data, but never did). And yes, in my experience it definitely makes a difference. I'm inspired to try this out as we build the name of Vogel Alcove as an expert in child and family homelessness. Thanks, Jared! Hi Susan, thanks for dropping by! I'm glad this post could inspire you, that's really flattering. It definitely takes a little elbow grease, but I'm sure a pro like you can get some great mentions, especially with a brand like Vogel Alcove! Thanks so much for this article. It is very enlightening and much-needed to grow my marketing for upcoming books and blogs. No problem Dan, I'm glad that you found it useful. Let me know how the strategies go when you start promoting your products!